CES 2018: LINKSYS launches WRT32XB Gaming Router designed for Xbox One. 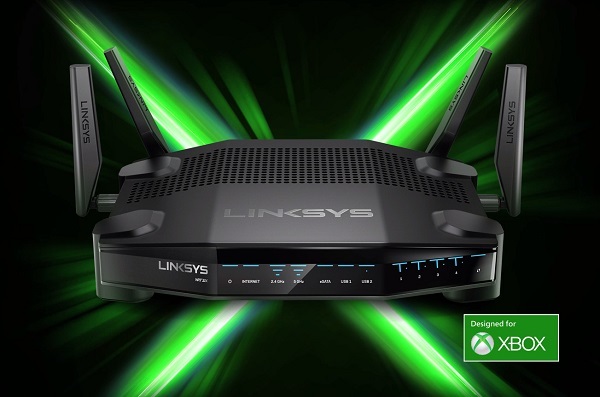 Linksys today announced at the Consumer Electronics Show in Las Vegas, the newest addition to the WRT product series - the Linksys Gaming Router designed for Xbox One - WRT32XB. The new WRT Gaming Router (WRT32XB) designed for the Xbox One family of devices. Linksys and Rivet Networks teamed again on the new WRT32XB, the only router optimized for high-speed gaming when using Xbox One. The WRT32XB router incorporates the Killer Prioritization Engine (KPE), which will auto-detect any Xbox One, including Xbox One S and Xbox One X, and prioritize gaming packets automatically to provide serious console gamers with the best online gaming experience. The Killer Prioritization Engine identifies, prioritizes and accelerates Xbox gaming network traffic from any Xbox One console above all other devices in the home to deliver lower ping times and optimize online gaming. The KPE protects Xbox gamers from extreme lag spikes at the router level and reduces peak ping by up to 65% on Xbox One consoles, delivering consistent and superior reaction time during intense gaming scenarios. For a limited time, users who purchase the WRT32XB router will receive a three-month membership to Xbox Game Pass at no additional cost. Xbox Game Pass provides users unlimited access to over one hundred Xbox One and Xbox 360 titles, including fan-favorite exclusives such as Halo, Gears of War and Fable.